Control the road - prolong the ride. The new Viking ProTech NewGen impresses through a great balance and a strong price-performance ratio - just perfect for a long and safe time on the road. It is suitable for cars from compact and executive class all the way to the sporty UHP segments. Safety and confidence on wet roads. The new ProTech NewGen offers you a new feel-good effect when driving in the wet. Several block edges provide a strong wet grip and wide circumferential grooves as well as widening inner shoulder grooves ensure an effective water dispersion. Feel the difference when it comes to handling and braking performance. The enhanced pattern stability and the well balanced stiffness distribution make the difference when it comes to handling and braking performance. Inside shoulder grooves and rib notches are reinforced by tie bars to ensure high pattern stability. Longitudinal outside shoulder rib ensure rigidity. The ProTech NewGen is an expert for long tread life and fuel economy. It is the next generation of silica-enriched tread compound with a new polymer technology which lowers the tyre abrasion and increases the tyre lifetime. The compound also provides an optimised rolling resistance for a fuel saving and eco-friendly driving experience. 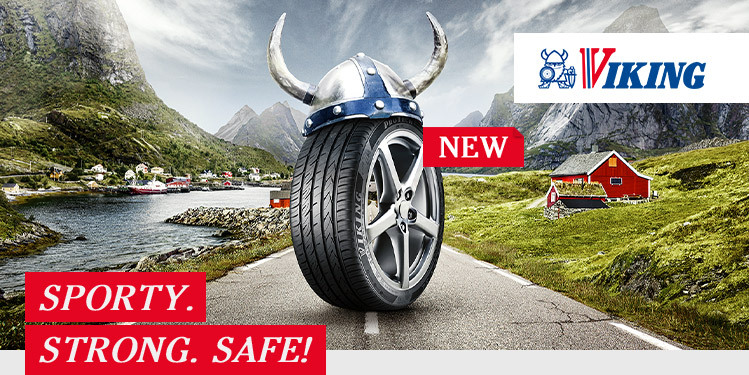 Buy a ProTech NewGen or other summer tyre from Viking now and save 5% on your purchase using the discount code "VIKINGEASTERRDTUK19". The code is valid from 08.04. - 14.04.2019 and from 29.04. - 05.05.2019 use the "VIKINGEASTERTUK19" code.